Trump made some big October promises. Can a lame-duck GOP Congress deliver? At the moment, it isn't clear the president's pledges are anywhere near making the leap from stump fodder to substantive action — and the clock is ticking. 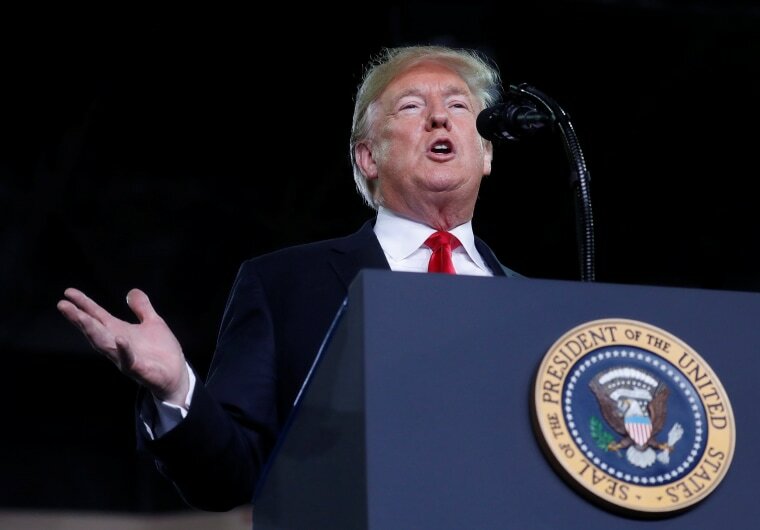 WASHINGTON — In the midterms home stretch last month, President Donald Trump's stump speech featured a string of notably ambitious campaign promises — tall orders even by the standards of election-year politicking. Most had a few things in common. They tended to feature stunningly swift due dates — movement on some, the president pledged, would begin even before Election Day. They tended to require congressional action from lawmakers busy running for reelection. Some of the most headline-grabbing pledges were relatively new additions to his standard political pitch. And for the most part, it isn't clear they're anywhere near making the leap from stump fodder to substantive action — or whether they ever will be. That was news to reporters. It was news to voters. It was also was news to the Republican congressional leaders whose task it would have been to turn that sort of promise into reality. One major problem for GOP leadership: at that point, none of the lawmakers who would provide the votes for such a measure were on Capitol Hill — for weeks, they had been back on the campaign trail in their home districts. Where are the middle class tax cuts President Trump promised? An even bigger problem: even if those lawmakers had been in Washington, and willing to vote for such a measure, it didn't actually exist yet. Midway through November, it still doesn't. “It's going to be a tax reduction of 10 percent for the middle class. Business will not enter into it. And this will be on top of the tax reduction that the middle class has already gotten. And we're putting in a resolution probably this week. I think these folks know about it. And Kevin Brady has been working on it very hard, really, for a couple of months. We'll put that in, and we'll start the work after the — sometime after the midterms,” Trump said at a bill-signing event on Oct. 23. The resolution didn't hit that week. And with a Democratic House takeover just weeks away, and a lame-duck session crammed with must-pass legislation, the likelihood that "sometime" is enough time to push through such a measure grows more remote by the day. Since Trump entered office nearly two years ago, he has tried — and failed — to get a GOP Congress to pass significant federal funding for the wall he’s promised along the U.S.-Mexico border. It's fair to say the incoming Democratic Congress isn't likely to make it a priority. And so the current lame-duck congressional session is the president’s last chance to secure significant funding before he's a lame duck himself, or out of office entirely. At his post-election White House press conference, Trump was asked if he was prepared to pursue a shutdown strategy at the end of this year in order to get the wall money since this could be his last chance to secure funding. He didn't rule it out. Trump made headlines a week before the midterm elections when he claimed, during an interview with Axios, that he was looking at eliminating birthright citizenship with an executive order. During the interview, Trump made a number of questionable or inaccurate claims, starting with his statement that the U.S. was the only nation which grants citizenship to all babies born within its borders. “Now, how ridiculous — we're the only country in the world where a person comes in, has a baby and the baby is essentially a citizen of the United States for 85 years, with all of those benefits,” he said. “It's ridiculous. It's ridiculous. And it has to end.” Around 30 other nations, including Mexico and Canada, offer birthright citizenship. The other eyebrow-raising constitutional claim: His insistence that he had the power to end birthright citizenship with an executive order. Most legal experts agree than a constitutional amendment — which would involve congressional action from the president's Hill allies — would be needed. In the final week of the midterm campaign, Trump pushed the issue heavily, tweeting and using it as an applause line at rallies. During a press conference the day after the elections, he told reporters he was looking at the issue “very seriously.” Two days later, the president assured reporters that an executive order was coming shortly, blaming the delay on continuing election recounts in Florida. Thus far, no executive order or draft amendment has emerged. In the closing weeks of the midterm elections, Trump made the approaching caravan of Central Americans intending to seek U.S. asylum a key part of his campaign messaging, threatening to deploy troops to the southern border and punish Central American countries by cutting foreign aid. “Guatemala, Honduras and El Salvador were not able to do the job of stopping people from leaving their country and coming illegally to the U.S. We will now begin cutting off, or substantially reducing, the massive foreign aid routinely given to them,” Trump tweeted on October 22, almost two weeks before the midterms. With midterms done, where's the caravan talk? Almost a month later, there has been no indication that the U.S. will cut foreign aid to the three countries. Since foreign aid is allocated in the federal budget — which is passed by Congress — it is unclear how Trump would be able to independently enforce his threat. Trump’s characterization of the aid given to Honduras, El Salvador and Guatemala as “massive” is also inaccurate. In 2018, the three countries received a combined $284 million, less than 2 percent of total foreign aid spending this year. As part of his “America First” approach to foreign policy, the president has long called for the U.S. to decrease the amount of aid it sends to other countries. Multiple White House budgets have proposed dramatic cuts in foreign aid, but those cuts have never been approved by Congress. The president repeatedly told his base at “Make America Great Again” rallies that he and Republicans would protect people with pre-existing conditions, even as their efforts to repeal Obamacare in the House as well as through legal action have sought to unravel those protections. Late in the campaign, they became a particular focus. “When it comes to health care, Republicans will protect patients with preexisting conditions. They're going to protect pre-existing conditions. I will always protect pre-existing conditions...” Trump said at a rally in September. But even as he made the pledge, his administration backed a lawsuit filed by 20 Republican state attorneys general that calls for the courts to strike down the entire Affordable Care Act — including its protections for those with pre-existing conditions. It still does. And there remains no plan from the administration or its congressional allies to push through any measure that would specifically guarantee those protections.